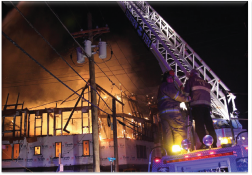 Launched by the National Association of State Fire Marshals Fire Research and Education Foundation, the Construction Site Fire Safety training program considers a wide spectrum of prevention strategies that can be implemented across all construction site stakeholders to prevent catastrophic fires in buildings under construction. Many of the fires in buildings under construction are very large, sometimes consuming entire blocks and even spreading beyond the construction site. Not only do these major fires place firefighters and construction personnel at great risk, they jeopardize entire communities. Available on-line or in-person, this course will promote an overall increase in awareness of the need for fire safe behavior on construction sites. We will discuss the need for cultural changes in an attempt to make EVERY person on the job site a dedicated safety advocate. The funding for this program was supported by the US Department of Homeland Security (DHS), Assistance to Firefighters (AFG), grant award EMW-2016-FP-00393.